The North Queensland city of Mackay sits on the cusp of a day of redemption. Last season the hopes of the local community were dashed by Mother Nature when a week long deluge of rain washed out their scheduled match at Harrup Park, the epicentre of Australian Rules football in Mackay. Locals were disappointed when the unceasing downpours washed out the highly anticipated pre-season AFL match between St Kilda – featuring local hero, David Armitage – and the Brisbane Lions. But this year the tropical city could be on the verge of one of the most exciting and important games of the pre-season. 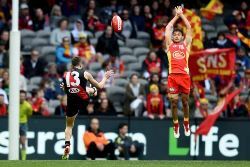 In a little over a month’s time, the Gold Coast Suns will take on the Essendon Bombers in a match where both teams have much at stake, even if it is the JLT Community Series rather than a premiership season match. Mackay effectively replaced Townsville as the northern Queensland centre for pre-season matches, but got off to a very wet and soggy start. Much has been said about the travails of the Bombers since 2012. But the new look squad, which lost 10 key players to suspension in 2016, has a big point to prove to the football community. After years of pain, the ‘Dons will not be in a mood for taking prisoners in 2017. Whilst they open the pre-season against Collingwood, the February 26th clash with the Suns presents as a huge opportunity to say to everyone “We’re Back…!”. With the expected return of star players such as Watson, Heppell, Hurley, Stanton and more, as well as unleashing their number one draft pick in Andrew McGrath, this is a different Essendon to 2016 and before. It will be a driven Essendon. But the Gold Coast Suns are surely on the edge of a razor blade. In what will be a do or die season for Rodney Eade, he has had a couple of seasons to build the club in his own way, setting up a successful era. But the question will always be a starting date for that success. If 2017 is a success, that new post-Ablett era might be a rosy affair. The youth on their list is either blooming or growing, or both. But “Rocket” Eade also knows that another year in the doldrums will place huge pressure on himself and everyone else down the line to the playing group. Like Essendon, 2017 looms as the year of change. And all of this, weather permitting, will play itself out at Harrup Park in front of an adoring or plainly curious Mackay crowd. North Queenslanders are renowned for travelling long distances to see quality events, and you can bet that the crowd will be laced with people from Cairns, Townsville, Rockhampton and the smaller inland and coastal communities everywhere across the region. AFL Mackay Regional Manager, Jeff Neumann stated in Mackay’s newspaper The Daily Mercury, "We have two elite teams coming back to play footy in our backyard.” “We have aspiring juniors who want to make it to the AFL ranks and everyone loves to see their heroes running around." He continued, referencing last season’s washout saying “the staff were pretty devastated with what happened so we are looking forward to the 2017 game getting up and running.” The paper stated that planning for 2017 continued immediately after the scheduled match was abandoned. The match is enormous on many levels – for the city, the region and the people involved in the game. It is also huge for both Essendon and the Gold Coast. People all over the north will be willing the rain to either cease for the game, or at least have the decency to go elsewhere. Northern Queensland will also see a return of the reigning premiers, the Western Bulldogs, and the Gold Coast Suns at Cazaly’s Stadium in Cairns on July 22nd for their Round 18 twilight match. Cairns fans will be keen to see local heroes in Jarrod Harbrow and top ten draft pick last year, Jack Bowes. It will be another big year for AFL football in North Queensland this year, but it all begins at Harrup Park, Mackay, at 3.40pm on Saturday 26th February.